This is a useful little widget from Metro that shows the live status of Clarendon station arrivals and departures. Other stations can be found here. A horrific accident on the Metro happened today at 5pm on the Red Line. Apparently two trains collided head-on between the Fort Totten and Takoma stations. 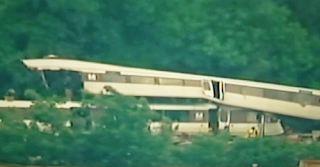 Some news agencies are reporting that one train actually ended up on top of the other train. WJLA is currently reporting 1 fatality and 9 injuries. Washington Post doesn't have any more details either. Metro reports that 2 train collided and one train is on top of the other train. affected. Further information to follow. As someone who rides Metro regularly, I didn't think this type of accident was possible. Very scary. The casualty count is now 9 deaths and 76 injuries. The trains did not collide head-on, but instead one train ran into the rear of the first stopped train. Every Thursday night Arlington Cinema Drafthouse hosts a stand up event with local comedic talent. The $5 show lasts from 7 to 8pm and features four different comics every week in a small, intimate setting. This week's show was made worthwhile by the always funny Seaton Smith. Seaton has performed at many local venues, including the DC Improv and RiRa. Seaton has a great comedic style, and I was very impressed that he did not reuse any of his previous jokes from when I saw him last at RiRa three weeks ago. I love his flip-flops routine, never gets old! A great little Italian restaurant named Dolce Vita is hidden away in Fairfax. This Zagat rated "best Italian food in 2006" venue also owns the neighboring Cantina, a smaller bar with the same menu. The appetizers are spectacular - I would recommend the Tasca and probably the best Bruschetta I've had. The pasta also does not disappoint, and I was very happy with the filling and tasty Fettuccine Botticelli. Full menu here. They also have live music with a violinist who walks through the establishment and serenades dinners with his great voice. Josephine is a upscale dance lounge featuring two DJ's playing house mixes. Located in McPherson Square on Vermont Ave, it is an easy commute from the Orange Line. The decor is very ornate and has plenty of staff tidying the place up constantly through the night. You need your name on the list to get in, which means either signing up online ahead of time or knowing someone working there. $20 cover unless you are a lady before midnight. If you want to sit down, a table reservation will set you back $500. So unless you have a large group wanting to stay the entire night, its best just to stay standing or try to squeeze in on the one free couch by the main stairs. The locale is great for DC people watching, as this venue attracts a diverse and very well dressed crowd. This included a 50-something man buying a table by the bar and stereotypically surrounding himself with nine scantily clad females. My hero. This is hilarious. Thanks GoRemy! I found out tonight that eating dinner at the recently opened Le Pain Quotidien on Clarendon Blvd is definitely not worth it. Very overpriced, slow service, and unsatisfying dishes. 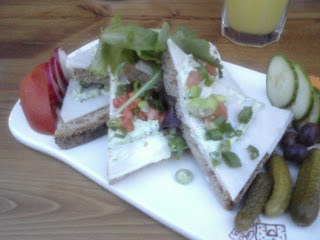 I chose the Roasted Turkey Tartine open faced sandwich, it was ok but not worth $10 and I was still very hungry. The lemonade is so super highly concentrated its hard to drink. Plus the food is served on cutting boards instead of plates, which always results in a messy table as it can't contain the loose bits. Unless you are going there for their bread or breakfast pastries, stay away. A great place for a quick and casual desert is Boccato Gelatos on Wilson Blvd across from Iota and Whole Foods. The small shop offers an impressive variety of refreshing gelatos. The young staff is always friendly and willing to hand out tiny samples of the ice cream. 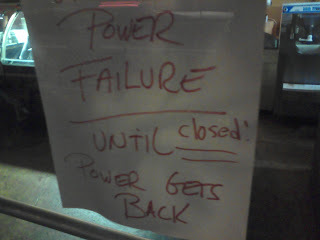 Unfortunately for me, the power failues on Edgewood Street due to the storm caused them to close shop for tonight. I also love the outdoor beanches of different heights. The place has gotten outstanding reviews and has a very appealing atmosphere. Jenny Lewis is once again gracing us with her talent at the 9:30 Club. The sold out show is opened by Deer Tick and Farmer Dave. This is the second Wednesday in a row that has featured rain and lightning, but I was determined not to let the storm keep me from missing Iota's open mic night this week. Despite the weather, more people than I expected made it out for the Clarendon nightlife. 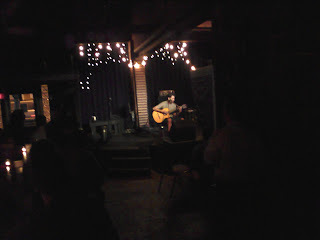 Iota featured a good and diverse mixture of acoustic musicians, including a Spanish signing artist pictured on the right. Iota also features another well kept secret: its intimate and casual back patio. Luckily there was enough of a pause in the storm tonight for a handful of Iotians to enjoy the outdoor seating. 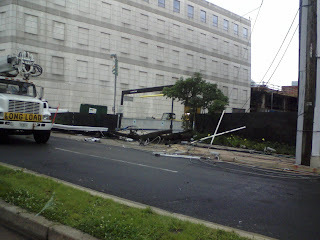 Massive amounts of rain, wind, hail and lightning ravaged Clarendon starting at 6am this morning. I doubt anyone was able to sleep through this storm, as lightning struck close by and caused traffic signals to turn off and car alarms to turn on. A telephone and electric pole next to the GMU campus was hit by a direct burst of fire from the sky, shutting down a portion of Kirkwood Road. 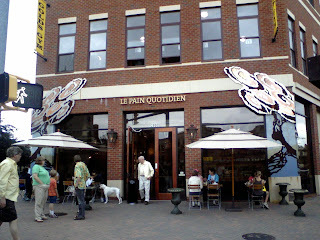 Le Pain Quotidien opened a few weeks ago below Gold's Gym on the corner of North Fillmore and Clarendon Blvd. The restaurant is an international chain and it's name translates into "daily bread" I believe, which is fitting as it offers good breakfast treats, fresh bread, and sandwiches. I would compare it to a little more upscale Panera Bread. For any fellow Metric fans: Pandora has just updated their player with their latest album Fantasies. This album features some amazing songs such as Gimme Sympathy. Pandora is an incredibly useful web app that allows users to create internet radio stations for their own personal music tastes. So you end up with stations that only play music you like, all the time. Pandora also analyzes your tastes and suggests new music that you may also like, so its a great way to discover new bands. Metric's profile on Pandora is here.